This week on the Celtic calendar . . .
May 16 is the feast of Brendan the Navigator, the Irish saint whose wanderlust took him on the travels that made him famous. Born in the southwest of Ireland in the late fifth century, he studied under St. Ita and was one of the "twelve apostles of Ireland" who were tutored by Finnan of Clonard. His travels began in earnest after he was ordained a priest and he spent the next several decades sailing around Ireland,before undertaking the journey for which he is known. Brendan's legendary voyage with a bevy of disciples (14 in some versions 16 in others) to the Isle of the Blessed follows the form of Irish seafaring folk stories of the time where travelers encounter a variety of fantastic characters and scenarios. 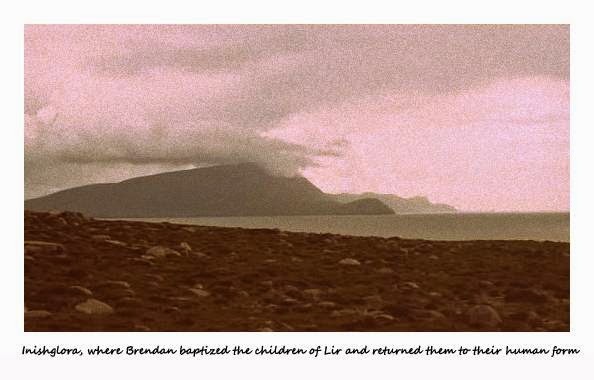 One of the Brendan legends intersects the myth of the Children of Lir, the three sons and one daughter of an Irish king who were turned into swans by their jealous step-mother. The magic destined them to spend 300 years on a lake by their father's castle, 300 years on the Sea of Moyle, and 300 years in the waters near Inish Glora off the coast of County Mayo. As Brendan stopped by the island, he discovered the swans whom he baptized, turning them back into the humans, albeit 900 year old humans who immediately died. 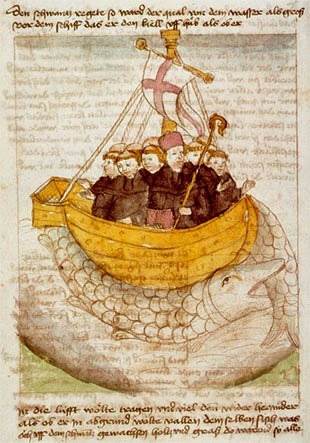 After returning from his exploration, Brendan continued to sail around the British Isles, studying with St. Gildas in Wales, visiting St. Columba on Iona, and establishing communities in Scotland and Ireland along the way. He died on terra firma while visiting his sister, Briga, at the community he established for her at Annaghdown although reportedly his remains were buried at Clonfert. While some scholars doubt the veracity of the Brendan tale, some of his descriptions seem to point to an encounter with real geographic places such as the icebergs in the north Atlantic and the volcanoes of Iceland. In the 1970s British explorer Tim Severin built a replica of Brendan's currach and sailed with a crew from Ireland to Newfoundland. He chronicled their journey in his book The Brendan Voyage which inspired composer Shaun Davey to write an orchestral suite by the same name.